I know it isn't quite Fall yet, we have about twenty-three more days, but I love everything about Fall. The clothing, the colours, Halloween, the food, the desserts. Everything. There's something about this time of year that makes me extremely happy. I swear, I suffer from summer seasonal disorder. 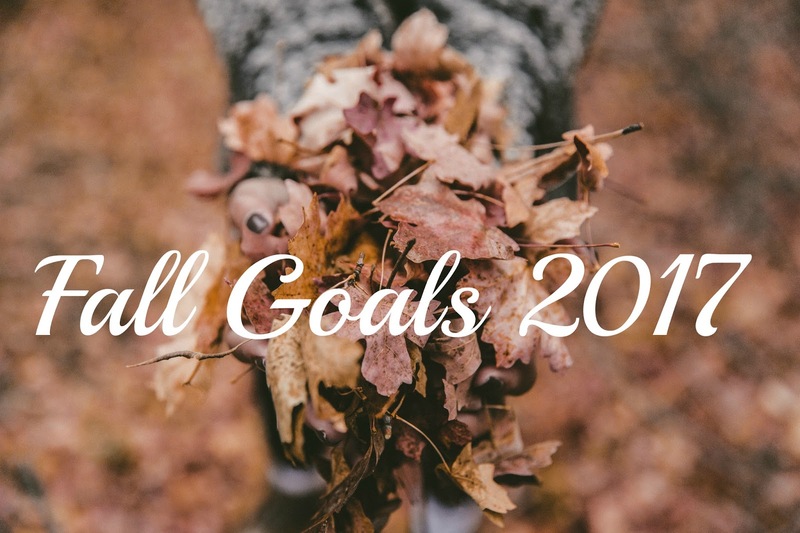 ;) So with Fall on the horizon, I wanted to share some of my goals for this season. If you're like me and love Halloween, check out How Alex & I Get Into the Halloween Spirit. **Also, I can't believe that it's the last day of August and that the blogging challenge is officially over. It's been fun sharing more and I think I'll try to blog a lot more from here on out. Thanks for following along! This is a simple mug. From all outward appearances, nothing special. 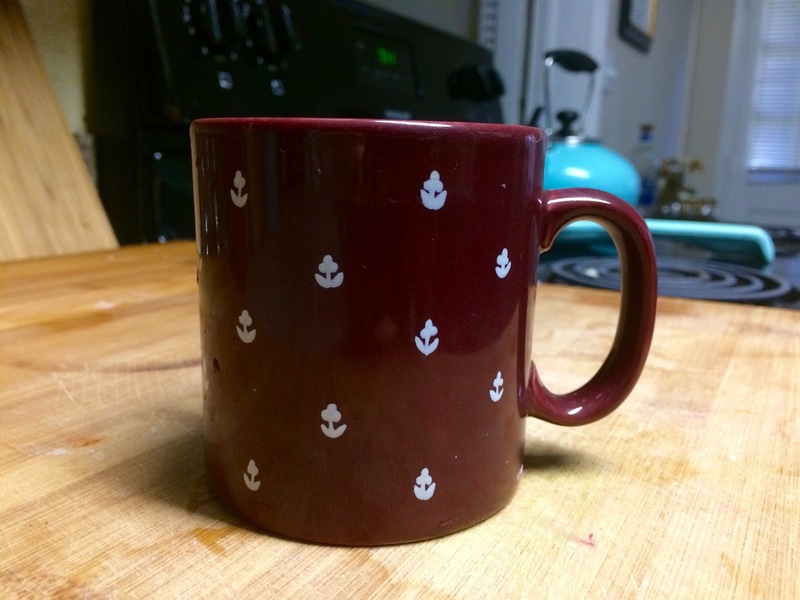 A hefty burgundy mug, with a painted white pattern - "England" pressed into the bottom in a curve. To others, this mug is nothing special. But to me it is everything. When Alex & I first started dating, we'd wake up at his place and he'd make us French Press coffee. And he'd always, always, always give me my coffee in this mug. So many mornings, where we'd sit in his living room, on that leather couch, sun filtering through every window. We would sit there drinking our coffee. Ruefully counting down the minutes until we had to go to work, away from one another. I still drink from this mug, and every time I do, it brings me straight back to those mornings filled with warm coffee, happiness and the love of my life by my side. Next week Alex & I are headed to Indiana to visit family. It's only for three days, which means we won't pack too much. However, there are always a few things that I always take with me - no matter how long I'm staying somewhere. Every time I fly I tend to bring the same carry-on items with me and they have since become my essentials. After years of perfecting the ultimate list, I've whittled it down to the bare bones. I hate bringing too much stuff just as much as I hate digging through luggage for things that I need in a hurry. 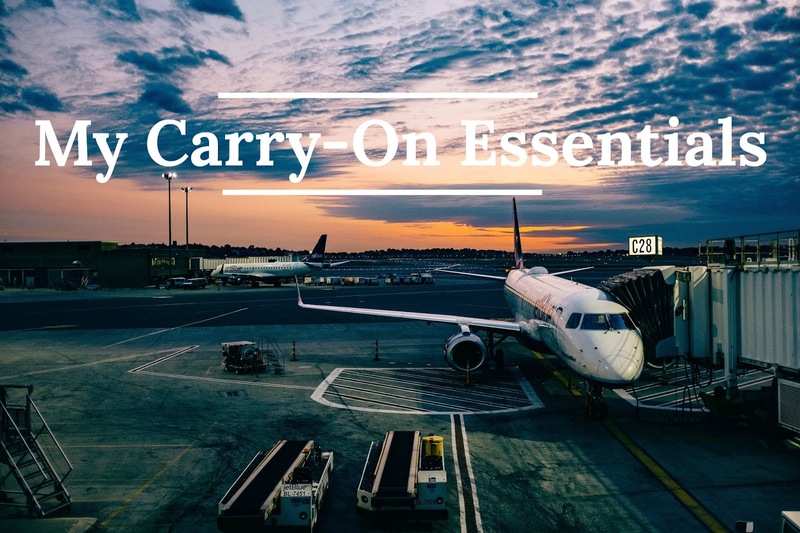 Therefore having a list of essential carry-ons is a must for me. As for the carry-on bag, I tend to bring my small mint backpack. It's perfect and compact and the colour makes it really easy in case I get lost in a crowd and Alex has to find me. I usually just pack a small purse in my luggage to use during the duration of my trip. Though honestly, there's been a lot of times where I just use my backpack! Wallet - for easy access to IDs, cash, etc. Is there anything else that you tend to bring for your carry-on? Is there anything that you think I'm missing? Let me know in the comments below! Alex & I wanted to binge watch movies this weekend. Since we had a lot of movies in our watchlist on three different platforms (Netflix, Hulu and HBO) we decided to kind of go all out this weekend and watch as many as we could. And in the spirit of sharing, I wanted to share the movies we watched. I've included a quick synopsis too. Who knows, maybe you'll want to check them out if you haven't already. Be Kind Rewind - Emotional and heartwarming. Two bumbling store clerks inadvertently erase the footage from all of the tapes in their video rental store. In order to keep the business running, they re-shoot every film in the store with their own camera, with a budget of zero dollars. I Don't Feel At Home In This World Anymore - A poignant thinker. When a depressed woman is burglarized, she finds a new sense of purpose by tracking down the thieves alongside her obnoxious neighbor. But they soon find themselves dangerously out of their depth against a pack of degenerate criminals. Nocturnal Animals - Thrilling dark and Lynch-esq. A successful art-gallery owner's idyllic life is marred by the constant traveling of her handsome second husband. While he is away, she is shaken by the arrival of a manuscript written by her first husband, who she has not seen in years. The manuscript tells the story of family's trip that turns into a nightmare. The Fundamentals of Caring - Sweet and comical. A writer retires after a personal tragedy and becomes a disabled teen's caregiver. When the two embark on an impromptu road trip, their ability to cope is tested as they start to understand the importance of hope and friendship. Boyhood - An emotional journey. The joys and pitfalls of growing up are seen through the eyes of a child named Mason, his parents and his sister. Filmed with the same cast over the course of 12 years, it captures family meals, road trips, birthday parties, graduations and other important milestones. Have you seen any of these movies? How did you like them? Let me know in the comments below! Don't worry, I haven't cut my hair. 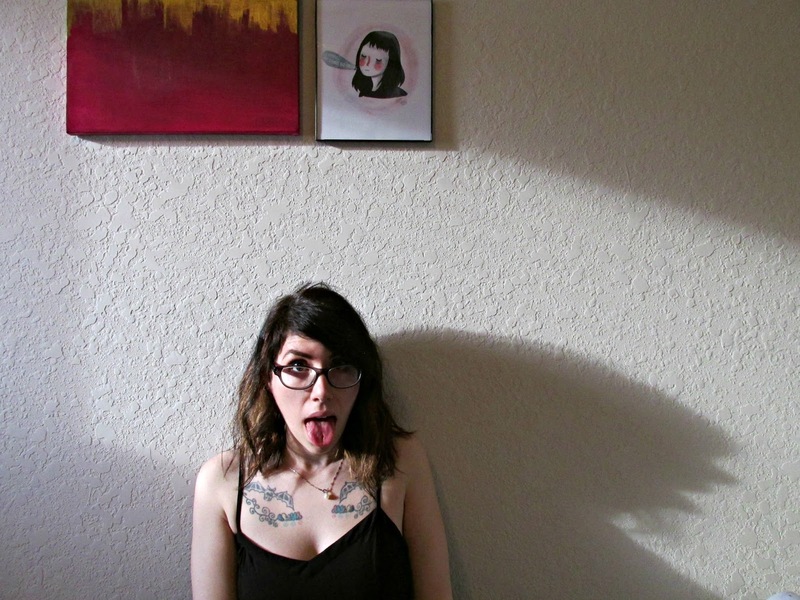 I just came across this photo, which was taken at the end of 2015, and I'm kind of digging it. It really sums up my goofball nature that Alex loves so much. Haha! Anyways, I thought it would be fun to do a little Q&A. So I've compiled a list of some of the questions I've been asked on Instagram, in comments or via email. It's always nice to have the answers in one place too. You can also learn more stuff about me here and here. Alright, let's get to the damn Q&A! How long have you known Alex? Wow, okay. I've known Alex for a long time. We actually dated when we were teenagers! We've known each other for almost twenty years. But after we broke up when we were younger, we lost touch for awhile. Okay, so maybe we technically haven't really known each other that long. But still. How did you and Alex meet? How long have you been together? Alex & I initially met through his sister. She and I were friends in middle school and she introduced me to her older brother. I was pretty smitten and Alex & I ended up dating. Neither one of us can remember why we eventually broke up, or for how long we dated that first time. However, when we re-met downtown in 2015 our lives changed forever. We picked up right where we left off (over seventeen years earlier) and we've been inseparable since. I should probably do I post about this, huh? Didn't you have another blog before this one? I did. It's name was Porcelain Heart, Ivory Tooth. 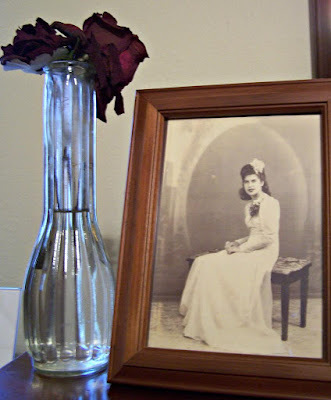 A long, winded name of a blog filled with memories that are better suited in the past. It's now a private blog. Why did you create this blog and close down your other one? When I created this blog I was in a transitional phase in my life, the relationship I was in was disintegrating. I felt like I needed to start new, realign myself and move forward. 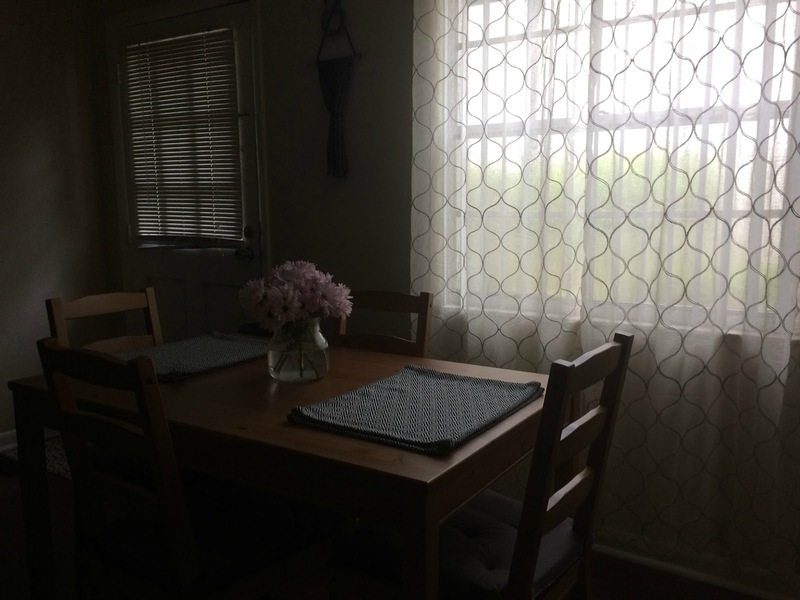 I wanted to make a space where I could grow and not be tethered to the past. How did you come up with the blog name Unspoken Spells? The name of my blog actually comes from a line in a poem I wrote a few years ago. It's a simple combination of words that have always stuck with me. Besides, I think it sounds cool. 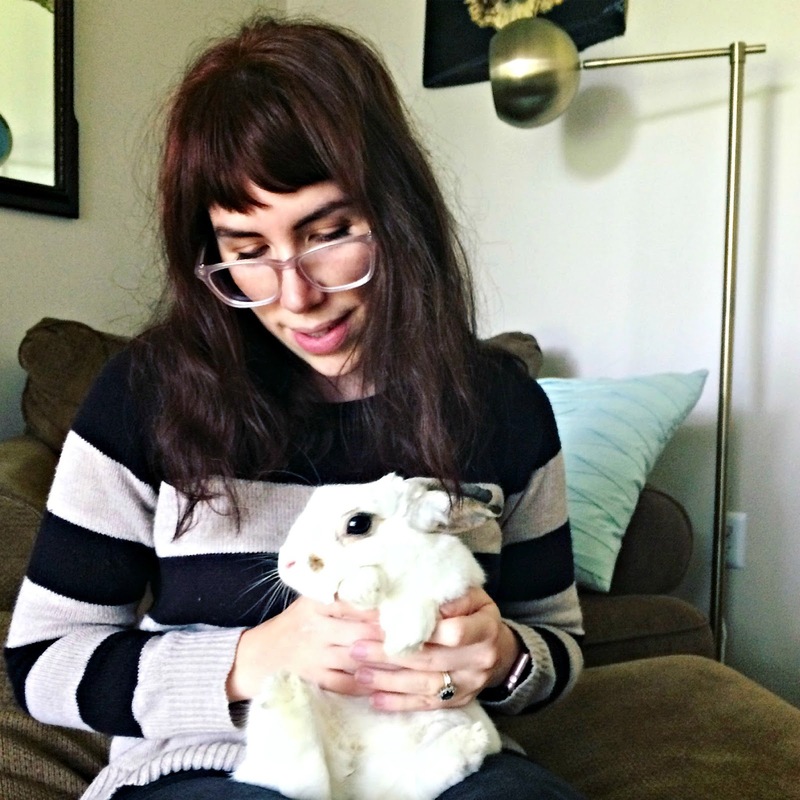 Is owning a rabbit hard? I mean, it's not as easy as everyone thinks. You can't just put a rabbit in a cage, or in your backyard, and leave them there. If you're thinking about getting a little bunny you can head over here for some tips. Keep in mind that owning a rabbit means you might just have a cute little bun for up to 14 years. It's a long-term, but adorable commitment. Olive is definitely a mix. The owner at the rescue shelter thinks she might be a mix of an English Spot and a Netherland Dwarf. Olive's weight and size is a pretty perfect match between the two breeds. She weighs around 4 1/2 pounds. You post a lot of photos, do you have any formal training? I wouldn't use the term "formal", because I didn't go to college for photography. However, I had photography classes for four years, while in high school. I even know how to develop my own film - man, I miss the darkroom! Since I was taught photography on a manual camera, I really feel as though it helped me hone my artistic eye. Seriously, it's a lot harder to take photos on a manual camera, compared to a digital one. There's a lot more finesse and patience that goes into. Also, if you like my photos be sure to check out my series Through the Lens - it's where I share my photography. I actually created it - thanks to the simple theme in Blogger! Now for a little backstory - the summer before high school I taught myself HTML and have been creating websites of my own ever since. I just use the Blogger platform, because it's a lot easier and I don't have all the time in the world to mess around with full HTML. Do you two own a house yet? Not yet. We're actually still renting and saving for a down payment on a house. Both of us know what we want in terms of a house and neither one of us want to settle on something we don't love. Even if that means waiting five more years to find the perfect house. Mainly because that house will be our "forever home". We aren't lacking in space now though - our apartment is a two bed, two bath. We just can't stand our upstairs neighbors. They're so loud! Do you have any tattoos? And how many? Do you want more? Yes I do. I don't have too many. Alex has more - he has a full sleeve. I have four tattoos. And yes, I do want more. In fact I have so many ideas of what I want, but I can't decide on a location for any of them. At some point, Alex & I want to get a joint tattoo. You used to not want kids, do you want any now? Alex & I both didn't want kids. In fact we started the relationship with that flat out on the table. No kids, ever. But it's funny how time changes things and how the right person can make all the difference. You can read what I had to say about it here. Will you ever share your poetry and short stories here? You used to on your old blog. I share a lot of my creative writing on this blog (which you can see here - but it's really all dedicated to Alex). I've shared like one poem on this blog. As for my old poetry, it's pretty depressing stuff. But I really would like to share more. However, I need to look into the copyright laws. I'm terrified that someone will steal my stuff - not that is spectacular or anything - but it's mine nonetheless. If you like writing too, be sure to checkout out My Writing Bag Essentials post. Do you and Alex want kids? From what I remember you used to not want children. If you’ve been following my journey since my first blog, you know that in the beginning, I was childless by choice. The funny thing about life is that sometimes the journey can change your mind. Since Alex & I started dating we couldn't imagine NOT adding a little one to the mix. And low and behold, Alex & I will be welcoming our first human child at the end of March 2019. If there's anything you'd like to ask me, let me know in the comments below! Just make sure to check the "notify me" box so you can get alerted when I reply back. I hope you all have a lovely weekend! I'll be back to the blogging game come Monday. Essential oils have always appealed to me. In fact, anything that isn't laden with chemicals or unnatural has always been my go to. Most of the time I'll forgo medicine unless I am dying. So, when I found out about essential oils, I knew it was something that I should at least look into. The first essential oil I ever got was tea tree oil and I was pretty impressed with it. I know a lot of people have jumped on the essential oil train in the last few years, but I've come to find that there's a legitimate reason for it. The first set of oils I purchased was a set of five by the company Nature Love. These essential oils have a carrier oil added to it. Which, even though I still use them, I kind of regret spending the money on them. I wish I would have done more research and just headed to my local health food store and purchased the ones there. The essential oils with the carrier oils aren't as strong as the ones without, but I've found that they work pretty well whenever I apply them externally. As for diffusing them, they leave the diffuser oily and the scents aren't as strong. However about a week ago I bought some essential oils from the health food store and they are 100% essential oils. With no carrier oils added at all. And they work wonderfully in our diffuser. I was able to get Tangerine by Aura Cacia and Goodnite Calming blend by Nature's Truth. I also got a spray for bites, cuts and burns. I've only bought three so far. Because I'm still researching which ones to get next. The ones that will be a perfect fit for our needs. So what do I use essential oils for? I actually use them for a lot of things. Cleaning, headaches, sleeping problems, a little pick me up, etc. But this might be a topic for another blog post. Besides, I do have a lot more to learn about essential oils, all their uses and specifics in general. For now, I just wanted to say that I'm loving this journey so far. Have you ever used essential oils? Which ones do you swear by? Let me know in the comments below, so we can discuss! I almost forgot to blog today.... but it's been busy. I had a staff meeting, finished up an article and headed to spin and yoga class. Alex made some awesome tacos for dinner and I made us a margarita to go with it. We've been spending our evening reading and watching Curb Your Enthusiasm and Parks & Rec. I don't really have too much to share today. Except that I'm almost finished with Sharp Objects by Gillian Flynn. I absolutely love her books. So far I've read Dark Places and The Grownup. I've seen both Dark Places and Gone Girl, but never read Gone Girl. Have you read anything by Gillian Flynn? Is there any book you'd like to recommend to me? Let me know in the comments below. I love hearing about new books! I can't help it, I love all things astronomy. Perhaps it's because it so incredible and inspiring. Maybe it's because even though I have a pretty good understanding of science, things like eclipses, blood moons and the moon in general are still magical to me. You can see my failed attempt at capturing the super blood moon of 2015: here. Regardless the reason, anytime something like this comes around - I feel a strong urge to experience the beauty of it. As we all know, Monday was the first solar eclipse in about 99 years and even though the state of Florida experienced a partial one - it was still awesome to see. Yesterday afternoon my Mom, Alex & I met up with Megan & Justin at a downtown park to see the solar eclipse. Luckily, Megan & Justin had the special glasses, so we spent our time sharing two glasses between the five of us. It was quite humbling to see the moon eclipse the sun, and of course, awe-inspiring. Even though I wasn't able to get any really awesome photos, the ones I did get will always be special to me: a memory spent with those who mean so much to me and a simple reminder of how incredible this universe truly is. On Saturday Alex & I took a little day trip to St. Pete to visit Mazzaro's Italian Market and we were thoroughly impressed. The photo was epic, the selection of goods that had was incredible and the desserts were killer. The place was packed and everyone there sounded like my New Yorker mother. Alex and I ate sandwiches on their patio and enjoyed some cold brewskies. I couldn't get over how packed the place was. Or how delicious (and cheap) our food was. Mazzaro's definitely a must if you live in central Florida. Plus, there's an awesome record store next door, which Alex and I spent a very long time in. It's called Bananas and it's absolutely huge with tons of records - most of which can be difficult to find. So, if you're into Italian food and records - this is an awesome trip to take. As for the rest of our weekend, we relaxed at home, watched the Defenders and imbibed on some homemade margaritas. All in all a perfect weekend. How was your weekend? I'd love to hear about it in the comments below! As for now, I'm still cooling down from the heat after a mini eclipse viewing party. I'll post all about that tomorrow - so be sure to come back for that. Ah, crystals. I'm such a sucker for them. Some believe that that each one has properties that help balance energy in physical space or inside the body. Some just find them beautiful. Whatever your reason, it doesn't hurt to better understand these stones. It's best to start with crystals that catch your eye. 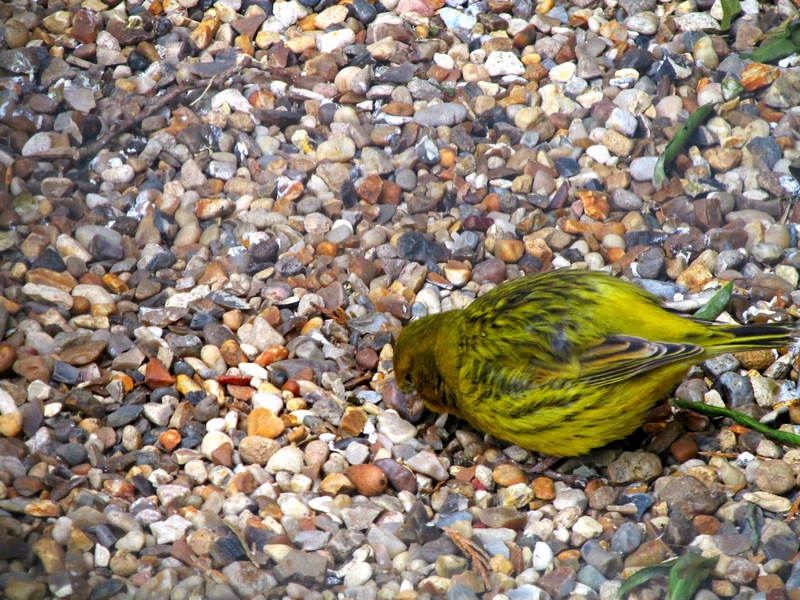 Afterwords you can move on to stones that bring protection. But the goal here is to find ones that you know you can benefit from. Below are a few starter stones you might want to consider. I like to view them as the foundation of any collection. You should store your crystals in a way so they do not damage each other. It's also a good idea to clean them. While some opt to wait for a full moon, most people clean them as soon as possible. You can easily do this by allowing water to run over them. I hope you have found this helpful. Do you have any crystals? 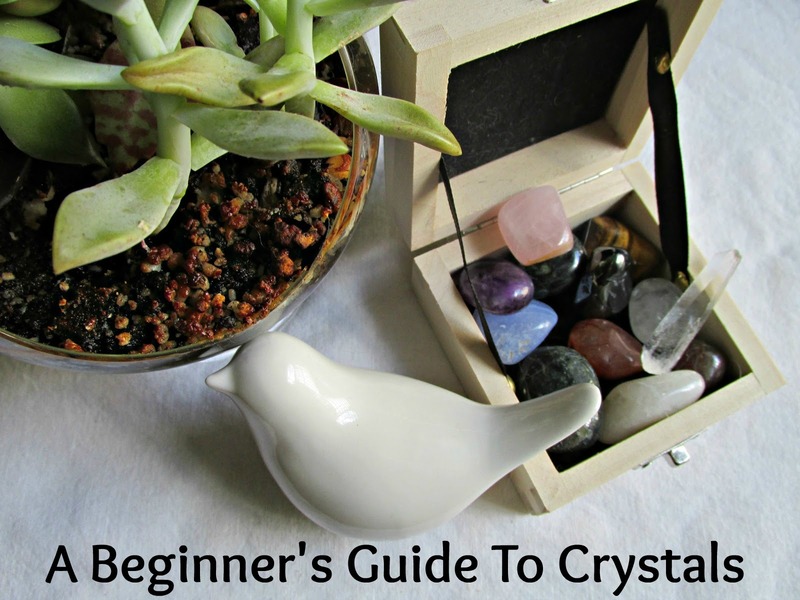 When did you first find out about crystals? Which stones are your favourite? Let me know in the comments below, so we can discuss! It's hard to try and come up with a way to say this, without getting political. But I don't want to just sit back and say nothing. Because this isn't okay - we are better than this! We have to be. I am so saddened in regards to the state of affairs within our country. Hate and discrimination is something I will never understand. I wish it was as easy as saying that love wins but for the times when it doesn't... it's hard to think of what to say or do. It is such a terrible thing when love and acceptance loses to hate, ignorance and fear. Although my voice may not be loud or even matter, I just wanted to put it out there. 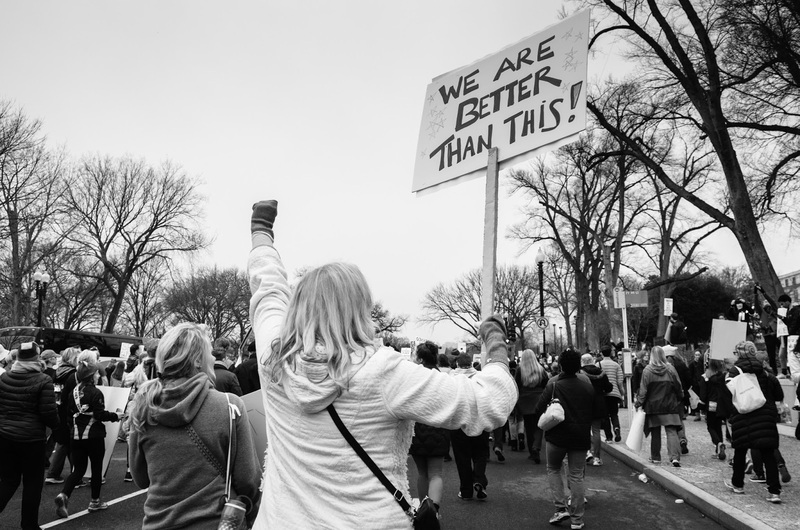 To simply add a small voice to a huge and serious issue. Have you ever been to England? Or overseas - and where? Where would you love to go? Let me know in the comments below. For awhile now I have been intrigued by the concept of slow living. A life of slow living is one that is intentional, minimalist in theory and relaxing. A time where you don't make plans or are constantly busy. It means that you actually have time to enjoy yourself and your loved ones. It can be as simple as cooking your meals instead of ordering out, or enjoying a cup of tea or coffee at home, instead of on the go. For me, slow living is actually a lot of things. It's listening to records on a Sunday morning with Alex. Reading a good book or having a picnic. The way our homemade meals taste and how good simple food should be enjoyable and relaxing to make. Having a cup of coffee in the morning, sitting at my table alone, and enjoying the stillness of it all. It's also about buying less and making more. Slow living is different things to different people. It's about finding time for what truly makes you happy. What do you think about slow living? What ways do you practice it? Let me know in the comments below, so we can discuss. I really thought I wasn't going to write about the weekend every Monday this month, but this weekend has been an awesome whirlwind! Packed with movies and time spent with family. On Friday night we had Alex's parents over for dinner. It was their 41st wedding anniversary, so it was nice to spend time with them. Alex made killer cubans for dinner and we watched Get Smart while snacking on delicious truffle popcorn. On Saturday, Alex & I did a thrift run, but went home empty handed. Later than afternoon we went over to my parents for dinner. We brought Olive with us and she pretty much tuckered herself out while she was over there. We all watched a Mr. Bean movie and then the movie Clear History, which is hilarious. It was Alex & my second time watching it, but the first time for my parents. If you love Larry David, you need to watch it. It was fun hanging out over there. We even left with my sister's dog, Molly - since Caitlin needed a puppy sitter for the night. As you can see below in the awful grainy, but really funny photo, Molly enjoyed wearing Alex's boxes as well. Afterwards we made a random trip to Ikea. All we bought was gummy dala horses and a little plush mouse for Olive. We've named him Barnaby and Olive tolerates him. Once we got home we watched Dark City. Fun Fact: but that was the first movie we ever saw together. Surprisingly the movie held up quite well for 19 years! We ended our night with Twin Peaks and Game of Thrones. Then today, Megan came over and we sewed like mad women. My Mom scooped us up and we went to Concord for coffee and Panera for lunch. It was really, really nice spending time with my Mom. The three of us talked about some serious stuff, but it felt so good to just talk. Very cathartic. I am very lucky to have her as my Mom and I really wouldn't be who I am today without her love and support. I'm looking forward to next Monday because the two of us are going to get breakfast together and I'm going to show her how I make my pizza dough. I think I might throw in an Ikea trip with her cause she's never been! So yes, my weekend was an awesome lovely family-filled weekend and my heart feels very full from it. I hope you all have had a lovely weekend. I'd love to hear all about it in the comments below! 1. Spin class. Last week I tried spin for the first time and I loved it. Which is great because I was really needing a cardio workout, outside of running. I used to run 3 miles 3 times a week and I could tell the damage it was doing. I mean don't get me wrong, I don't foresee not running at all. I still run a mile two times a week. But having a different type of cardio in my arsenal is great. Last night, Megan came with me to spin and we finished it off with a yoga sculpt class. Which really made any soreness I felt last week non-existent this morning. 2. E-Books via the library. I've had a library card for years now. Sometimes I'll borrow books, but for the most part I don't. Which is crazy because I work right across from the library. Either way, I just found out that I can borrow e-books. I mean a part of me knew this, but I guess I forgot. I've downloaded a few books this month and I'm really excited about reading good books for free. Don't get me wrong, sometimes there are gems within the free Kindle books, but for the most part they're crap. 3. Proper weekends with Alex + Olive. Alex used to have Sunday & Monday off, but now he has Saturday & Sunday off and honestly, I'm digging it. Olive is too! This weekend we have a lot of plans too. Tonight his parents are coming over for dinner and we are celebrating their anniversary with homemade Cubans, truffle popcorn and a movie. I still have to get some flowers and balloons, but I'm pretty excited. Then tomorrow night we are going to my parents to spend some time with them. As for Sunday, it's pretty wide open - except for a Twin Peaks viewing party with Alex, my sister & Jeremy. I'm also going to make some homemade pizza in my cast iron skillet. Yum! I'm really looking forward to next weekend - we're going to St. Pete to explore Mazarro's Italian Market. Thanks for the recommendation Terri! 4. Thrift stores. 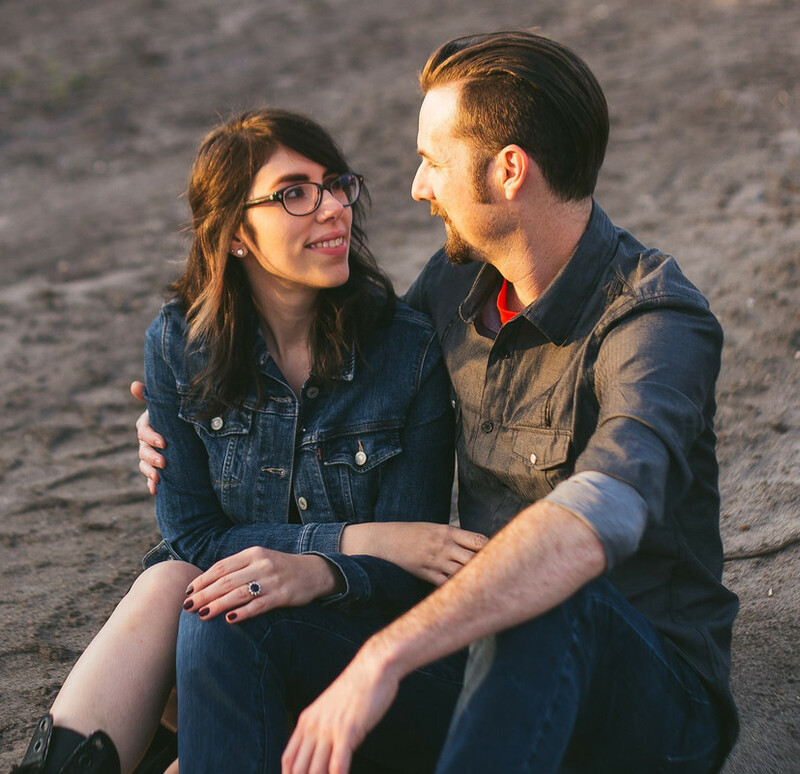 Alex & I are saving $$ like crazy both; for a house and pregnancy fund (Wait, what?!) - don't worry guys, I'm not pregnant -yet! So with the majority of our normal "fun money" going towards savings, I've been hitting up thrift stores whenever I get the urge to buy something. Which is pretty good because most of the time I don't find anything and when I do it's something amazing and cheap! Whether it be a perfect wicker basket or the sweetest dusty rose colored skirt - which I still need to decide if I should shorten the length or not. I used to go to thrift stores a lot when I was younger, so it feels as if things are coming full circle over here. 5. Spinach Salads. Weird thing to put on here, but I seriously cannot get enough of them. They've been my go-to work lunch for the past few weeks now. I'll add in leftover chicken (I can't stand reheated chicken, so it works), garbanzo beans, sunflower seeds, tomatoes, fruit and chia seeds. As for dressing, I love splashing on some olive oil, red wine vinegar with salt and pepper. What are the 5 things that YOU are currently loving? Let me know in the comments below. Or if you make a post of your own, be sure to leave me the link! Not too long ago, Olive got a rabbit-tat which was a major upgrade from her previous pet store cage. I know that the majority of people who read my blog won't be interested in this, but I figured it might help future bunny parent's who stumble across it. 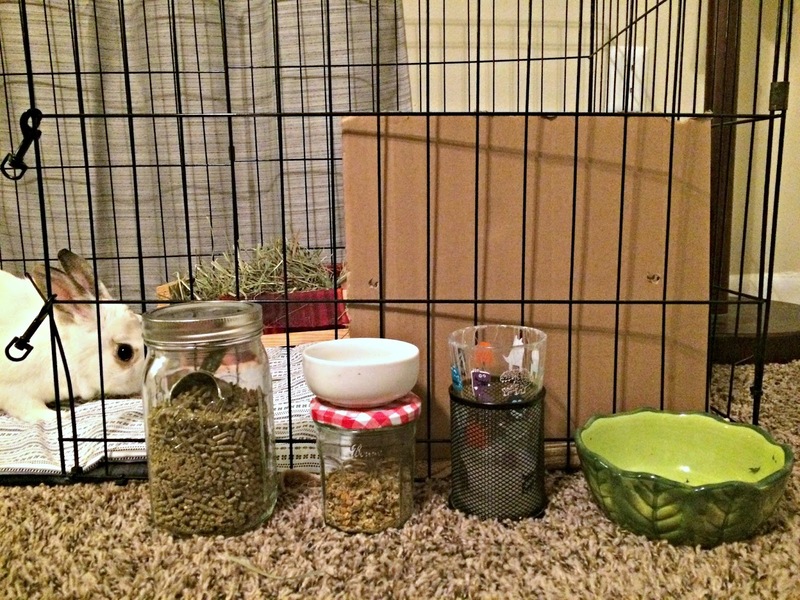 Sadly, the majority of rabbit cages that you can get at pet stores are actually too small. 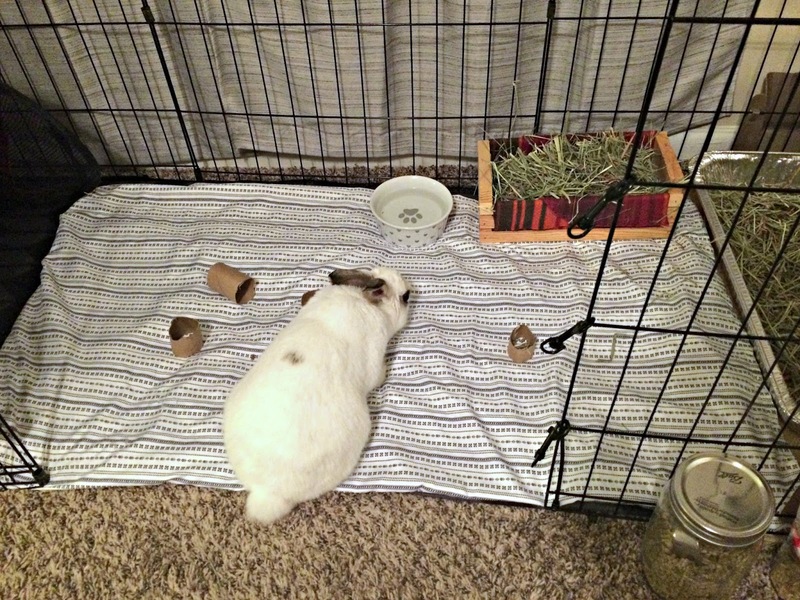 Rabbits need space to sprawl out and relax - it's what makes them happy! Now Olive is definitely a small bunny (she weighs about 4.5 lbs), but she's actually quite long too (around 20 inches). Which means by the time you put a bowl, litter box, and hay container, a pet store cage gets small pretty quickly. The last cage she had was livable only because the top of her 'hidey hutch' had a lounging area. But it was still too small. This is where an x-pen comes into play. The best part is that x-pens are usually about $50 less than a large rabbit cage at any given pet store. 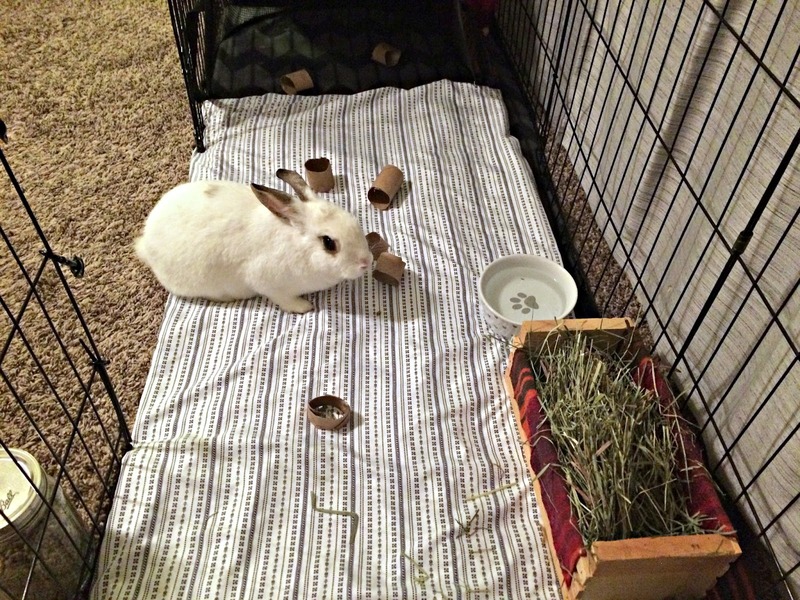 I paid $100 for Olive's first rabbit cage and only $25 for her current "cage". See those quotation marks there? It's because her cage isn't really a cage. There isn't even a topper on it and the only time the door to it is closed is when I'm at work. Since we keep her in our heavily bunny-proof bedroom, there's nothing to worry about. And honestly, now that we have a higher bed, she spends most of her time under it anyway. We refer to it as her lair. Haha! "Cage": a metal x-pen - this one is 24 inches high and works like a dream. It can be made into a long rectangle and has an opening that you can use as a door. The best part is that Olive hasn't tried to jump out of it. If you worry that 24 inches is too short, they have taller ones as well. As you can see on the outside of her cage I have her pellets, chamomile flowers, ceramic food bowls and cup for water. Why? Because I like having everything she needs right there and honestly, maybe it's out of laziness. Either way, it works. 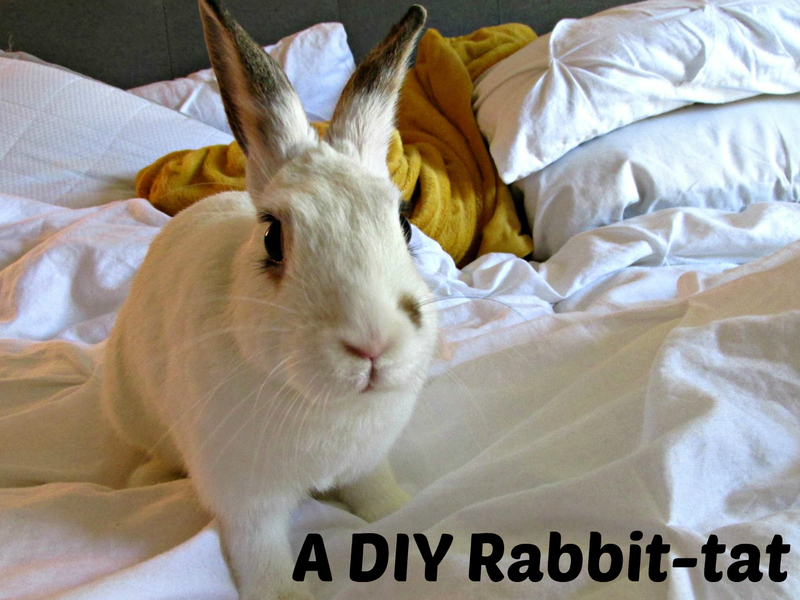 If you're considering getting a rabbit as a pet, be sure to check out my Quick Guide To Having A Pet Rabbit. And as always, if you have any questions - let me know in the comments below. I will try my best to answer your questions. My sister and I spent a lot of time at my maternal Grandparent's house growing up. With our parents being divorced, and my Mom working full time, we spent the majority of our summers and afternoons at their house. 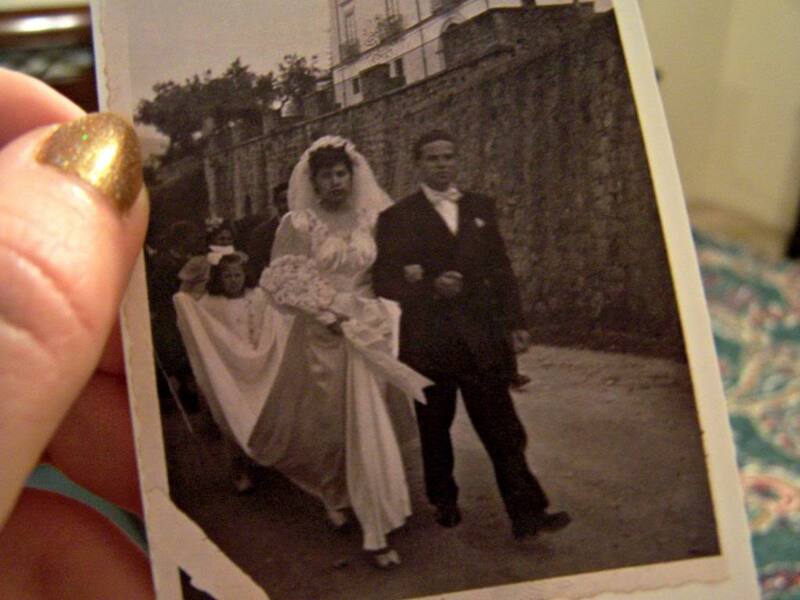 Thankfully, I have a lot of wonderful memories with my Grandpa and Grandma. I loved spending the night with them the most though; eating delicious home-cooked Italian dinners, talking and laughing while my Grandpa called me his little gypsy and watching Jeopardy and Wheel of Fortune in the living room while Grandma would answer all the questions and solve all of the word puzzles out loud. And I'll never forget how she would pin curl her hair. I remember her sitting in her recliner with a black, velvet pouch covered in pink & red flowers with dark green leaves resting in her lap. As she watched over us, she would gingerly section off her wet hair and slowly coil them into neat, little spirals on top of her head. Securing them into place with the metal bobby pins from inside that black velvet pouch. It was something I admired, even as a little girl. And something I can still so clearly remember as an adult. Sometimes I wish, that after Grandma had passed, I would have asked to keep that pouch of her, those metal bobby pins still kept safely inside. Perhaps maybe having that memory is worth so much more. And it's weird to me, that something so innocent as recalling her doing that simple act will sometimes make me cry. Today has been quite busy and I've been rather tired. But in the spirit of blogging every weekday this month, I'm checking in with a quote that has been on my mind lately. The other day, while I was reading Bright Lights, Big City, there was quote that resonated with me so much that I just had to share it with you all. This quote reminds me so much of everything I was going through during 2015. Especially in regards to my divorce. But it also reminds me of all the hope that I experienced that year with the new life I was finding with Alex and all of the amazing things that came along with it. The start of something new, finding my footing, remembering who I was again and letting the past fall behind me without getting caught up in it's netting. Life is a series of events that you can either let soften you or harden you. I choose the former and will continue to, again and again. I hope you all had a lovely day! As for me, I think I'll be retiring to the bedroom a lot earlier than Alex & I had planned. Now I don't think I'll do a weekend recap every Monday, but the last weekend was pretty fun, so I figured I'd share ours. Friday night we went out for Mexican with Megan and Justin. Margaritas were had and Megan and Alex "nerded out" over Game of Thrones. It was First Friday downtown so we walked around, went to the antique store down there. Then made our way to Scout & Tag and a record store. We all found some records too! Alex found two Steve Martin stand-up records and I found a Hall & Oates vinyl of Private Eyes. Afterwards we all went back to our place where we played video games and listened to music. Saturday, after yoga Alex & I hung out, ran some errands and then went on a coffee date. Which was followed by an awesome thunderstorm and a trip to the bookstore. We ambled around in random stores too. We spent the rest of the evening vegging out and watching TV. Saturday was actually pretty uneventful come evening time. I was pretty tired since Olive woke me up around 5 earlier that morning. And after all the running around, I was spent. Sunday rolled around. I made us breakfast, with homemade no-knead skillet bread, scrambled eggs and french press coffee. The bread was so, so good and really easy to make. You can find the recipe here. Then Alex headed off to work for a tiny two-hour shift since they needed an extra chef of staff for brunch. Afterwards we went on another coffee date and I finished my book that I started a few weeks ago. It's called Bright Lights, Big City by Jay McInerney. It's written in second person and absolutely incredible. For dinner we had chicken tacos and then headed over to my sister's to watch Twin Peaks. We finished off our weekend while watching Game of Thrones while Olive hung out with us in the living room. So, that was our weekend? How was yours? I hope it was awesome! Let me know in the comments below. ​I've been working out for a long time now. Which is a big deal for me because I used to not exercise at all in my early twenties. Even though I've been in my workout routine for awhile now, I'm still learning a lot. And it goes without saying that I am by no means a professional. I just do what's right for me and what makes me feel good about myself.​ I'll be honest, some weeks I only get two sessions of cardio in. Other weeks I get at least 4. It really depends on how I'm feeling and what life is like. But the one thing I always get in is yoga and weight training. Because it helps me focus on my personal wellness. Yoga really helps me manage stress and make me feel more centered. 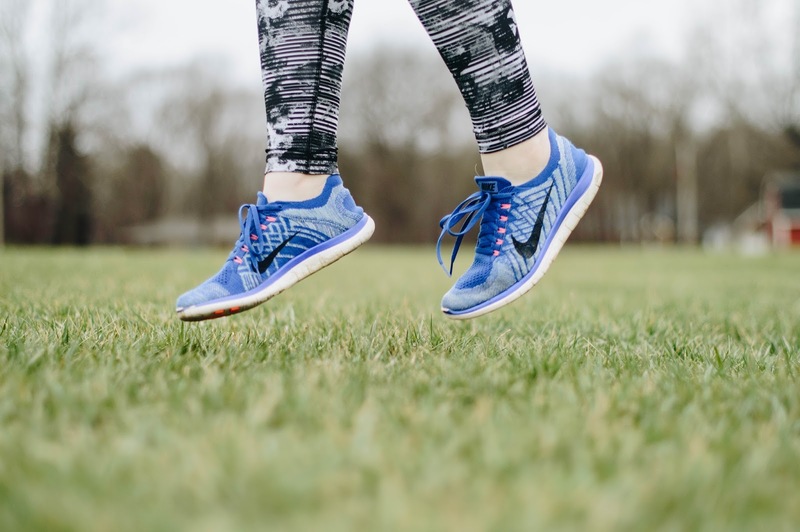 Tuesday - Cardio at home: I've scoured Pinterest for some at home cardio routines and these are the best ones I've found... one and two. I actually work up quite a sweat and the best part is that they only take 20 minutes. I also throw in some weight training with a 5lb dumbbell. Here's a really great one too. Wednesday - Cardio & Bend and Flow Yoga: Once I get to the gym I run for 20-30 minutes. I'll run for a mile and depending on how I feel, I'll run another half mile and then I'll interval between a 30 second sprint and a 30 second rest. Raising the speed from 6 mph to 8 mph. I also use this Interval Workout on days where I don't feel like running at the same speed. Afterwards, I'll head to a 45 minute yoga class. Flow yoga focuses on holding poses and flowing between lots of poses - we also focus on balance. Thursday - Cardio & Yoga Sculpt: If I don't feel like running again I'll either use the stair stepper or elliptical for 20-30 minutes. Although this might change. Yesterday I tried a 45 minute spin class for the first time - and I loved it. I don't do any weight training on this day because the yoga class uses weights.Yoga Sculpt is a 60 minute class that focuses on poses with weights thrown into the mix - this is the yoga class where I burn the most calories. Friday - Cardio at home: This is still an up in the air workout day. I had intentions of starting this today, but after last night's spin class and Olive waking me up at 5AM, I'm a little worn out. But next Friday... I'm coming for 'ya! Saturday - Yoga Fit: Sometimes I'll run before hand, sometimes I don't. But I've found that even if I run for 10 minutes prior to yoga class I get a lot more out of it. Yoga Fit is an active 60 minute class dedicated to holding poses and doing deep stretches. Which is great after I've worked out all week long. I always leave this class feeling like a new person and completely relaxed. As for counting calories, I don't really do it. I am just conscious of what I consume. I try not to eat too much sugar - it makes me sick to my stomach. I try to eat a lot of veggies and lean meats. I eat very little processed foods and bread (trust me, it happens sometimes) and I try my hardest to stay away from cheese. Even though I don't count calories, I do love using my Apple watch to figure out how many calories I've burned during any given workout. Mainly because I am always amazed by how much I do indeed burn. I used to have a Polar watch and it was okay, but the Apple watch is a lot better. I hope you enjoyed seeing what my weekly workout routine looks like. I had a lot of fun sharing it! I'll check back in with you all on Monday. I hope you have a lovely weekend! Do you work out? What does your weekly workout routine look like? Let me know in the comments below. I can't believe that it's already Thursday! Seriously, how did this happen? I didn't really have a specific post in mind for today, so I figured I'd catch you all up on what my week has been like so far. Who doesn't love a rambling post? This week started off perfect because it rained all day Monday. I absolutely love rainy days and it was made even better by the fact that Alex & I spent all day in bed. We also finally finished watching Bored To Death. Tuesday was pretty much uneventful aside from making a cherry clafoutis and working out at home. My glutes are still sore from all of the squats and lunges! Which I secretly don't mind because sometimes I don't feel like I've truly worked out unless I'm sore the next day. On Wednesday evening I went to yoga. Afterwards Alex made us burritos for dinner and then I booked it to the writing group at the library. 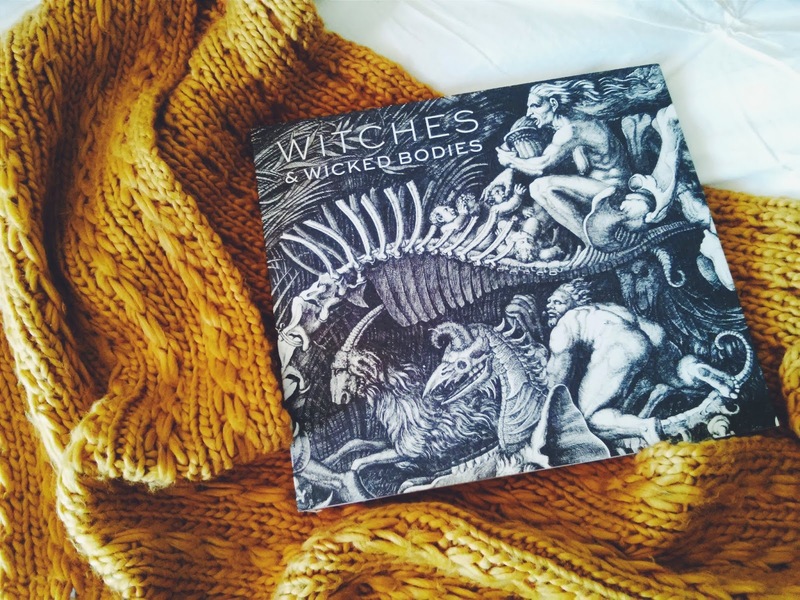 My friend Megan and I have been attending this group for awhile now and it's really great. We had a write in, which I loved. I mainly worked on transcribing some old poems into digital format. Even though my intention earlier that day was to work on my piece of flash fiction that I started a few months ago. As for the flash fiction piece, I've been tweaking it for awhile now and have toyed with the idea of turning into a short fiction piece. It's really unlike anything I've ever written before, especially in subject matter. So there is a part of me that would like to see where it can go. As of right now, I really need to focus on character development and see where it takes me. Tonight I have another yoga class and this weekend is the first weekend of Alex's new schedule. He's switching back to a normal Monday-Friday and I'm really excited to have a proper weekend with him. Aside from another yoga class Saturday morning, our weekend is pretty much wide open. There's been talk of a coffee date sometime on Saturday. So we'll see what happens! I hope all of you have had a lovely week so far! What are your plans for this weekend? I think tomorrow I will do a post about my workout routine. Be sure to check back for that! Sometimes there's a bag of cherries sitting in your fridge that is getting too close to being too ripe. 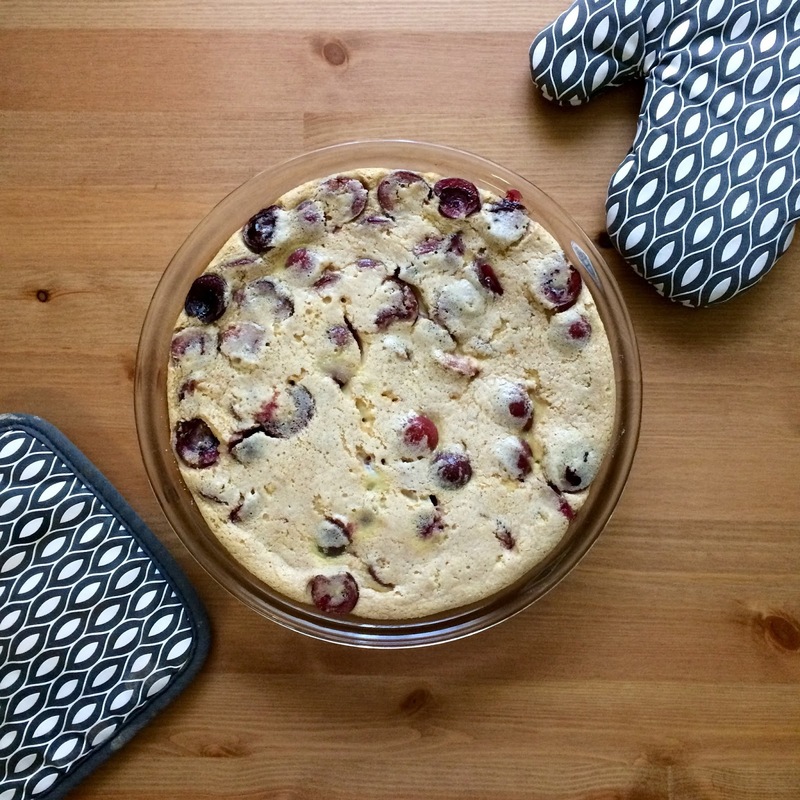 So, when life gives you cherries (that we're thankfully on sale) sometimes you just have to make a cherry clafoutis. This simple and rustic French dessert is perfect for summer days and is delicious served both cold and warm. As I was making this cherry clafoutis last night, I noticed that it was very similar to the Swedish Apple Cake I made back in May. So, with that in mind - if you don't have or even like cherries - go ahead and substitute in whatever fruit your heart desires. You won't regret it! Traditionally the French leave the pits in, claiming that when baked, the pits give off a almond flavour. But, the idea of biting down on a pit doesn't seem all that appealing. So I simply cut the cherries in half and removed the pit, and threw in some almond extract. If you want to go the traditional route, I commend you. Alright, let's get on to this silk and creamy recipe! Preheat the oven to 350 F, take a stick of butter and generously coat the sides and bottom of a 9 inch glass baking dish. Sprinkle with granulated sugar, tapping to make sure that the dish is evenly coated. Go ahead and pit the cherries (I just took a knife and cut them in half) and arrange them in circles on the baking dish. The bottom of the dish should be completely covered with cherries. In a bowl mix the eggs, sugar, salt and extracts until well blended. Then pour in the melted butter and mix until smooth. Next you'll add in the flour, mixing until the batter is completely free of lumps (I used an immersion blender for this step and it worked great). At this point the batter should be really thin. Also here's a tip: the smoother the batter, the better. Because if it isn't 100% blended it won't be the clafoutis won't be as silky as it should. Immediately pour the mixture over the cherries and bake for 35-45 minutes. The goal here is to have the clafoutis puff up and be slightly golden brown in colour. Just make sure you don't overcook it or it will be rubbery. Yes, the middle will be slightly wobbly in the center - but it's completely fine. It will cook as it cools and nce it cools, cut it up and enjoy the deliciousness. I just love how rustic this dessert looks. It is so simple to make and deliciously rewarding. If you're feeling adventurous, you can sprinkle some powdered sugar on top. I think next time I'll be making this with blueberries. Let me know if you try this recipe! I'd love to know if you like it or not. 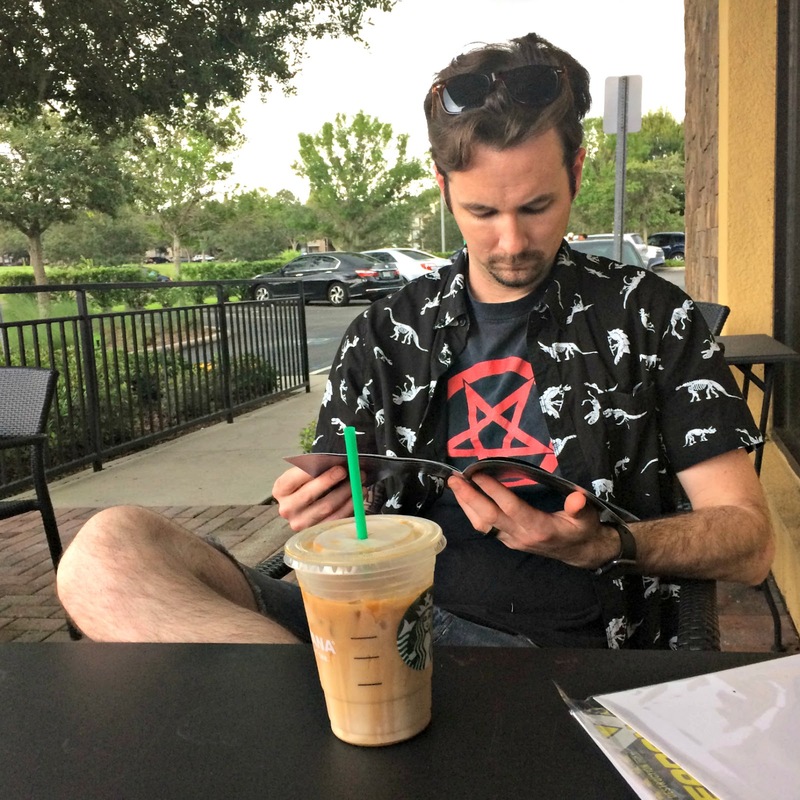 I'm kicking off the August Blogging Challenge with a classic things you didn't know about me blog post. Why? Mainly because I love reading these types of posts. Besides, I thought it would be fun to share some random-ish facts about myself. Hopefully you enjoy finding out some new facts about yours truly! Let’s get started, shall we? The one show that I can watch again and again is Seinfeld. It's also one of the shows that I the most in daily life. I was on the yearbook committee in high school. Yes, I was that nerd. I took photos and wrote. I don't care what people say; a good vanilla bean ice cream is the ultimate flavour. If I could live anywhere in the world it would be either Whitby, England or New Orleans. My engagement ring and wedding band are the best gifts I have ever received because Alex came along with it. My mom grew up in Bronx and I still can't understand why she ever moved to Florida. I feel more at home in NY than in Florida. My favourite cocktail used to be a Ramos Gin Fizz. But now it's margarita on the rocks with a salted rim. 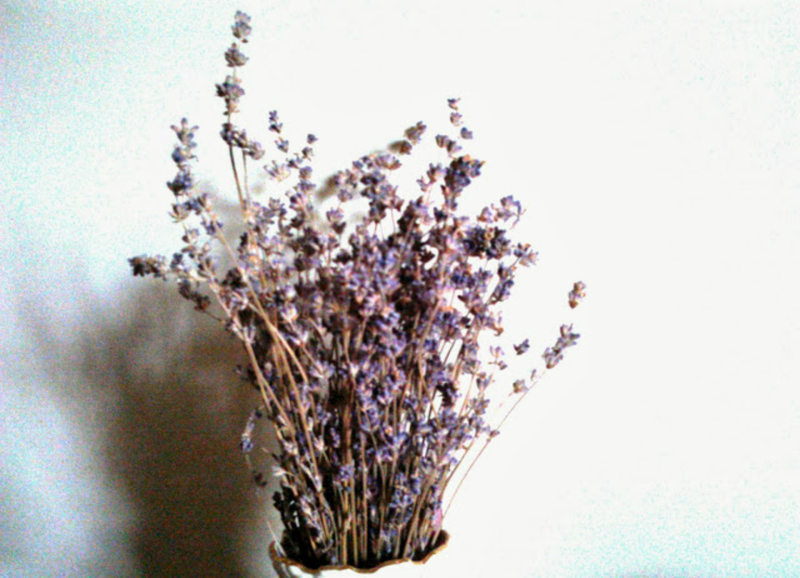 I love the smell of lavender, but cannot stand the way it tastes in baked goods or drinks. I've never had braces, but always wanted them when I was younger, but I didn't need them. I always wanted glasses too... and well, you can see what came of that. I first met Alex when I was 14. We were just babies and neither one of us can remember why we broke up. Before Olive, I had a cat named Keeks. As a child, I had both cats and dogs. I drove to Texas by myself when I was eighteen. That was also the first time I went to New Orleans and feel in love with that city. As for Texas, I don't ever want to go back. Sorry if you're just finding this out, Mom. Womp womp. 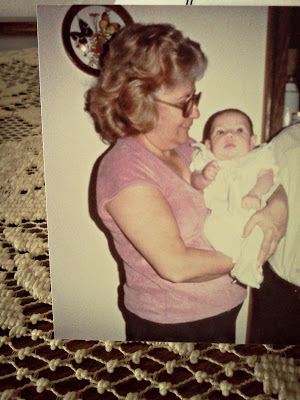 The first time I was on a plane was when I was a year old - my mom & I were headed to New York to see my newborn cousin. With that being said, I love flying, but loathe the idea of being on a large boat. I initially went to college for interior design, but then transferred to another school and got a degree in liberal arts. The first movie Alex & I saw together was Dark City - all the way back in 1998. In the past, Alex & I both didn't want children, but now we're set on having just one. I like to think of awkward/random band names, for example, Crunchy Mustard. It's something that me, Alex and my sister have bonded over. "Hey everyone, we're Crunchy Mustard. We're gonna to play a couple songs for you tonight...". It's ridiculous, but fun. I have seasonal summer depression. The heat makes me incredibly lethargic and quite sad. Megan & Alex like to joke that I'm a cat and just might fall asleep under a car in order to get some relief from the summer heat. Hahaha. I like gloomy, rainy days and cooler weather - they are my jam. Yes, I know I live in the wrong state, but Florida does have some really amazing thunderstorms. It's the only redeeming quality. I've been writing poetry and short stories since I was in middle school. I've been asked before if I'll ever want to publish them, but I'm unsure. When I was younger I was extremely against the idea, but now I don't think I'd be too opposed to it. I'd rather spend money on good coffee than on mediocre food. Latte, French Press, chicory, pour overs - whatever it is, I'm down. I don't enjoy shopping as much as I used to and I'm fine with that. However, I am not opposed to wasting a few hours in an antique shop or IKEA. Don't forget to stay tuned for tomorrow's blog post!